THIS IMAGE WAS TAKEN A FEW YEARS AGO, ON A TRIP THAT WAS TWO YEARS IN THE WORKS, THE PLACE WAS CALLED WAPUSK NATIONAL PARK, IT IS 45 KM. SOUTH OF CHURCHILL, MANITOBA ( CANADA ) THE HOME FOR POLAR BEARS ( FEMALE ) DENNING AREAS, I OR SHOULD SAY GROUP THAT WERE SO LUCKY TO COME BACK WITH IMAGES OF ONE FAMILY AS YOU CAN SEE, FROM THE SHOT THIS WAS ONLY THE SECOND DAY FOR THE CUB OUT FROM THE DEN AND HIS'S FIRST STEPS ON THE ICE AND TAKING A SPILL, BUT HE IS LEARNING AND MOTHER IS TEACHING,THIS WAS ON MY WISH TO DO LIST, AFTER 15 YEARS IT REALLY HAPPENED, DREAMS DO COME TRUE. What a dream come true, Peter. The cub taking a spill is so cute — absolutely priceless. Congrats on fulfilling your dream. A wonderful image! What a charmer! So cute, and a lovely scene as well. So glad your dream came true and we get to share a little piece of it. Wonderful when dreams come true, Peter! 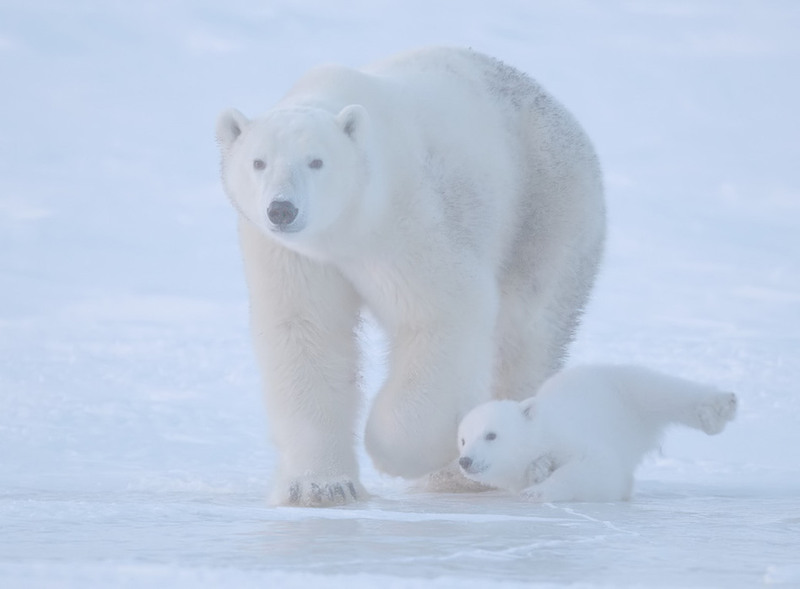 The tiny cub learning how to walk on ice just makes the image so special. A trip and image to treasure! Beautiful image Peter, love the little skater! Cute moment and eye contact, well depicted Peter, shame about the fog/haze.